Vintage Cathedral Diamond Engagement Ring in 14k Rose Gold | Shane Co. This gorgeous engagement ring features 34 round, hand-matched diamonds, at approximately .33 carat total weight and is part of our exclusive Couture by Shane Co. collection. 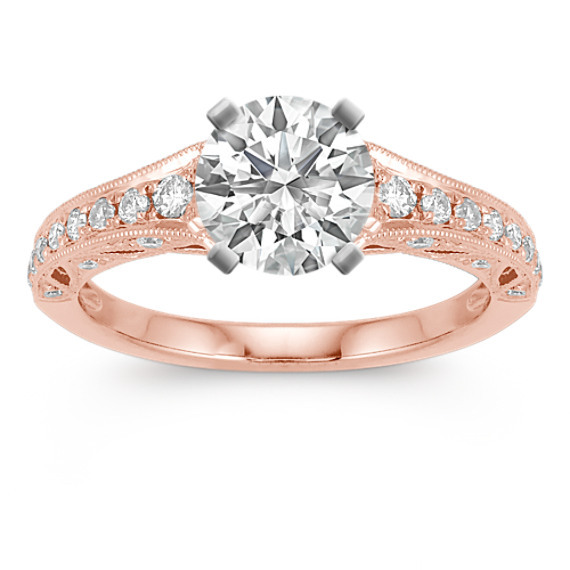 The vintage design is crafted from quality 14 karat rose gold with intricate side detailing. Personalize the look by adding a center diamond in the shape and size of your choice. Got this for my wife, paired with an oval white sapphire, and the matching contoured band when we got married. It was perfect for her, she loves the vintage style and the rose gold, and she gets tons of compliments on how beautiful and unique it is. I like vintage style. Not to ornate but different. ? I got this ring in yellow gold. The accent stones are good quality & sparkle. I like vintage & unique, my ring is just that.